This was not something we had planned on this brief trip, but after a beer or two at the Wasdale Head Inn we were suddenly considering tackling a mountain! 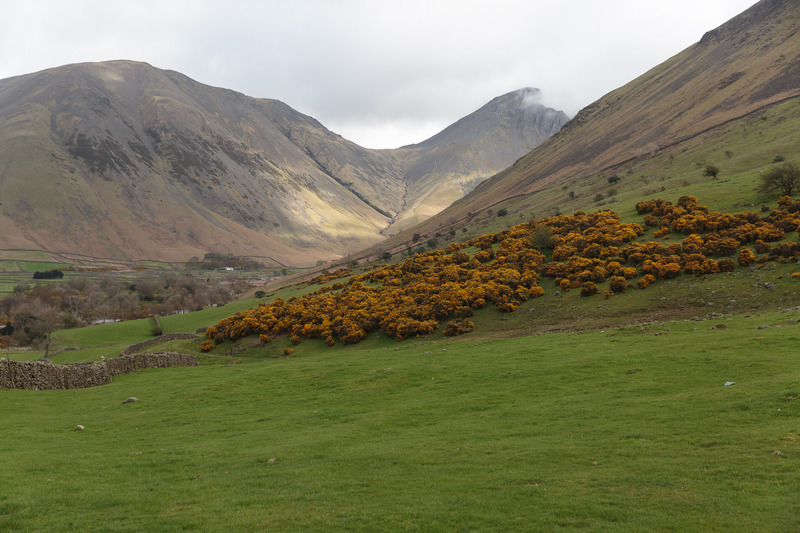 After a brief stint in the Highlands my wife and I had decided to spend a couple of nights at the wonderful National Trust Campsite at Wasdale. It was a great location, utterly away from it all and in an area of the Western Lakes I had not been to since I was a child. It also helped us break up an otherwise long car journey south. 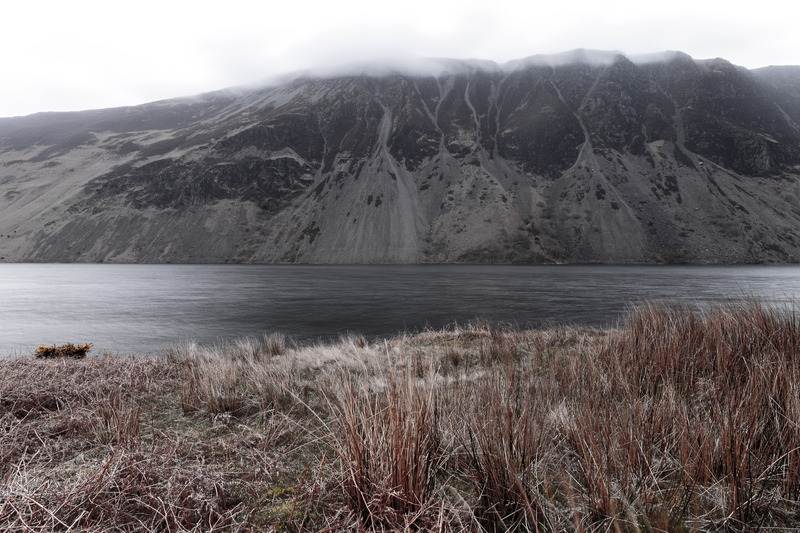 We took in such wonders as Sellafield Nuclear Power Station en route but after a four hour journey we arrived alongside the marvellous Wastwater and into a stunning valley, which was bathed in magnificent light. Alas we were were racing the fading light to get our tent pitched, so I didn't get a chance to stop and stare for a while. Perhaps I should have because my eyes were out on stalks and on these narrow Cumbrian roads you need to keep them firmly on the road. I can still see so many of the images I framed in my mind on that gorgeous evening. 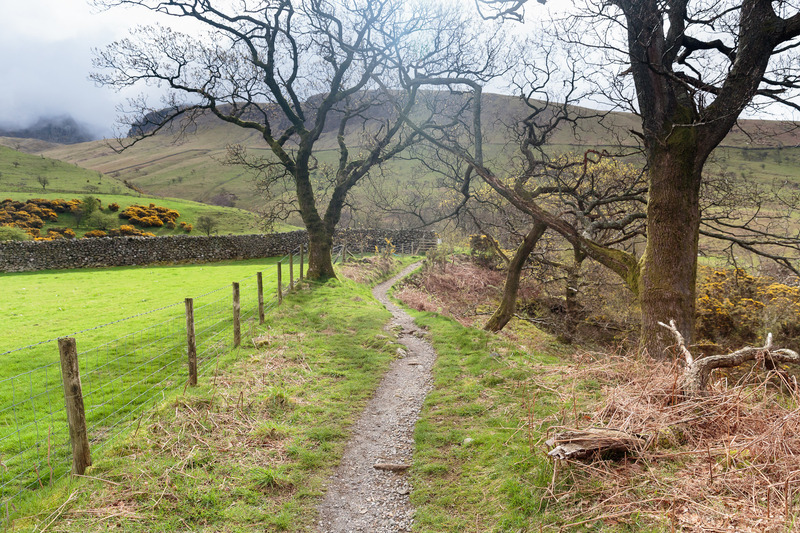 The NT campsite at Wasdale is situated in a stunning spot at the head of Wastwater and the foot of Scafell and the Pike. With a pub just minutes away and the valley sides offering up a number of Cumbria's best peaks, this was a very special place. We had no real plans but to relax, to explore, so we headed off to re-hydrate at the local pub. 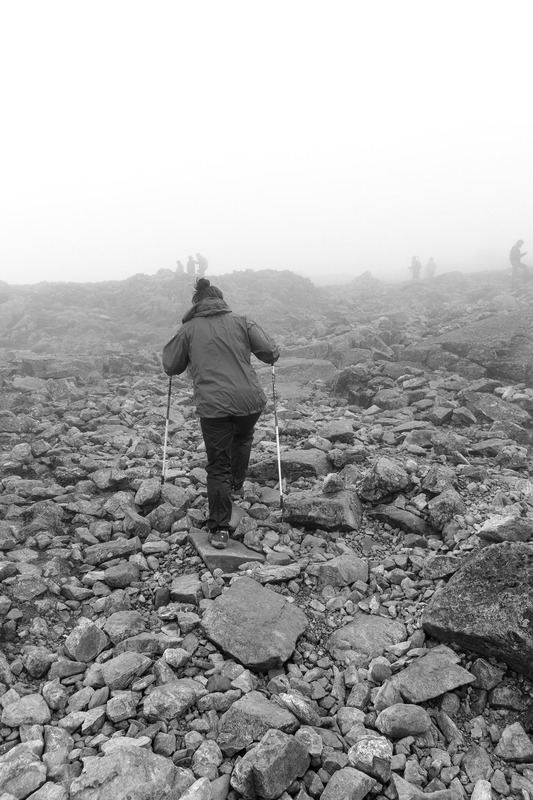 We chatted to a policeman and part-time Mountaineer from Liverpool, bonding over a crossword. 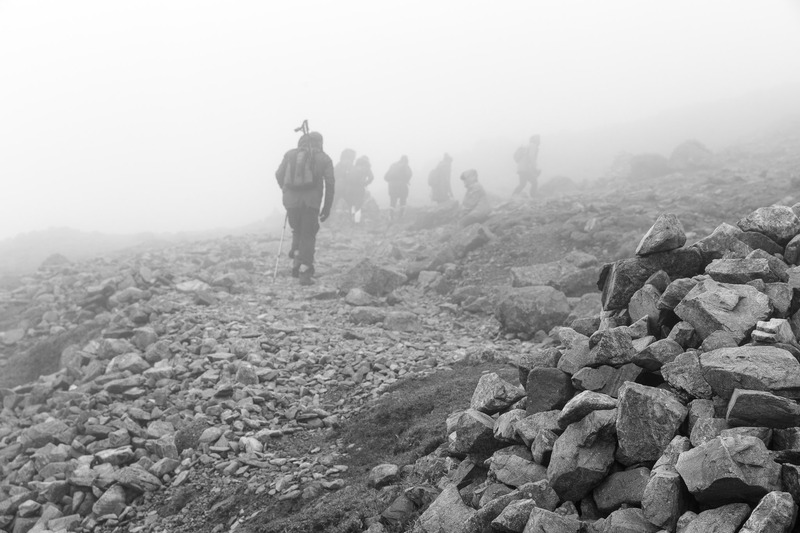 A few tales were told and we started to warm to the idea of climbing Scafell Pike the following day. We really had no idea what to expect. We were now armed with a route or two and some dos and don'ts. There was a modicum of intrepidation. 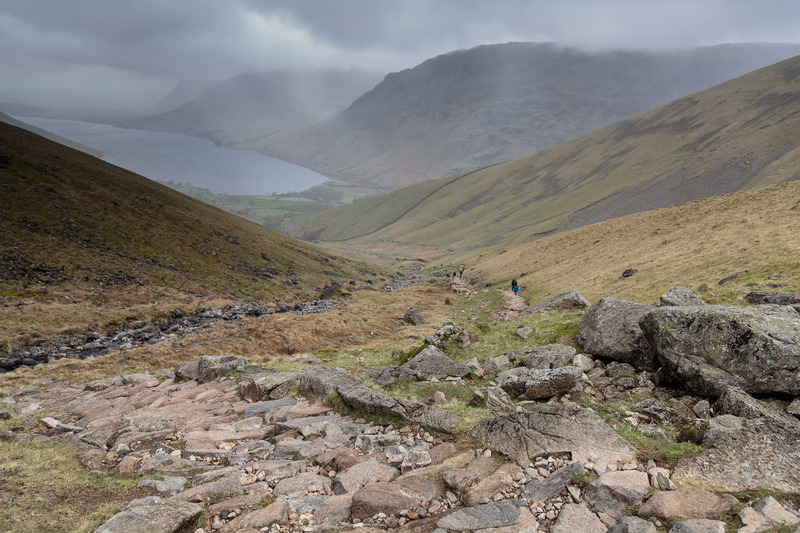 How long would it take to climb Scafell Pike? How hard would it be? 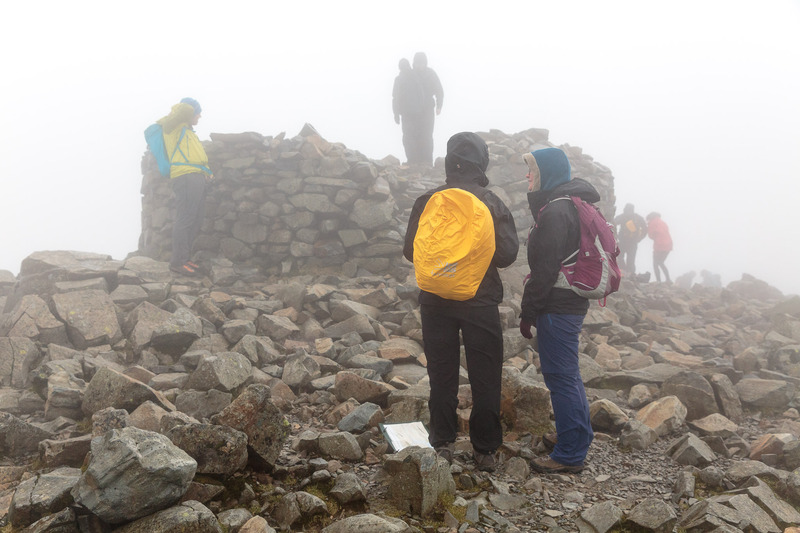 We checked the weather, talked kit, checked maps and before long we were heading back and setting our alarms. I'd heard that the previous day it was gusting 50mph on the summit and the windchill was in the region of -20C. I knew that layers were important to climb Scafell Pike and I packed my gloves, as my hands never appreciate anything south of -2C. I wanted to get a good carb-rich breakfast in early and make sure we had plenty of water and snacks to keep our energy levels high. I'm far from 'unfit' but I knew this ascent would prove difficult as I've always been designed more for speed. Couple that with a few extra kgs, short legs and an array of dodgy joints and Joss Naylor's record was going to be quite safe. The stepping machine was not part of my gym routine. Of course there was no chance of an 'ascent' without at least some of my camera gear coming. Now, this is usually where things get out of hand. I would do better this time, this was a mountain! After much deliberation I think I settled on a 5D MK 3 body, tried to shun the battery grip but found I hadn't packed the battery door. Oops. I impressed myself by packing only one lens. After the single lens anxiety had abated in went the massively under-used GoPro. You are supposed to record these things to bore your children in the future aren't you? I had spent a fair amount on a carbon fibre tripod for just such an occasion, so I added that too. 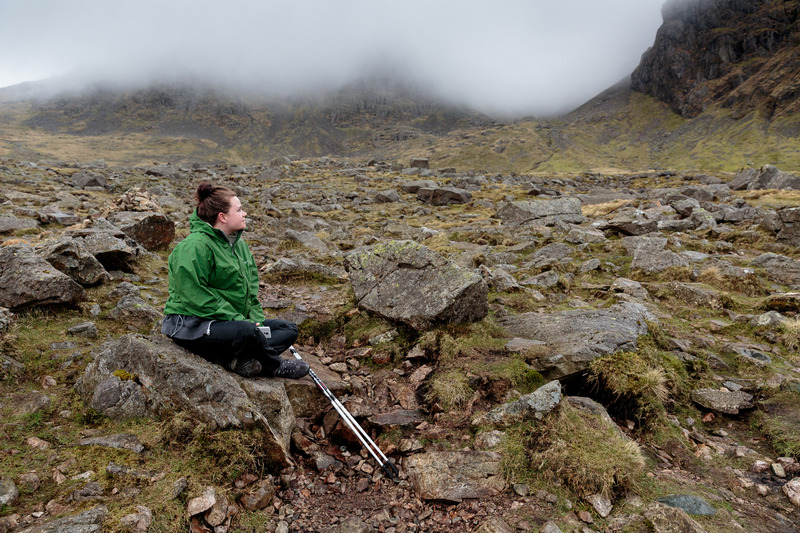 A few batteries, a remote, the odd filter, a number of flapjacks and plenty of water. Thankfully my Lowepro Flipside Sport 15L is compact and lightweight. It offered just enough storage and protection for a trip of this nature. It is also orange so should something go awry I had something to wave frantically. 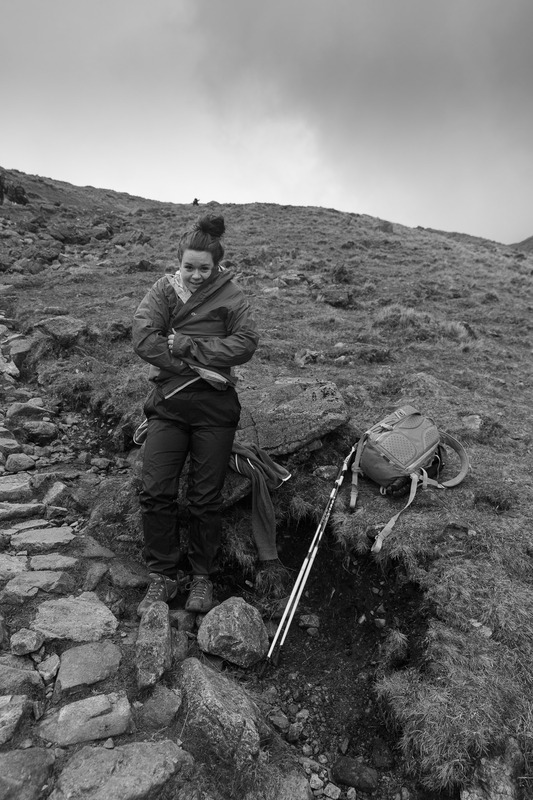 The tripod strapped to the back and allowed my hands to be free to make use of my Leki poles which I knew would be very useful. We set off at approximately 1030am, an hour later than our original ETD but that allowed us plenty of time for a leisurely ascent of about 3 hours. I mentioned layers earlier and both my wife and I learned very quickly that the idea is to add layers as it gets cooler, rather than to wear them all at the start. Now with several items of clothing hanging off my rucksack and waist we continued upwards mopping sweat from our brows. The overnight rain had made the almost cobbled paths very slippery and the going was slow. 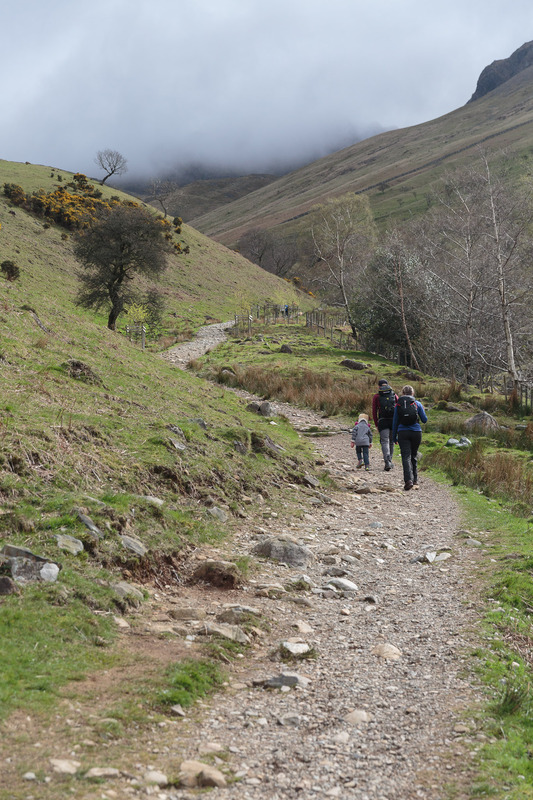 The paths ramped up quite quickly and we had to cross a ghyll to continue our progress upwards. My partner in crime is not a great fan of heights and also has a minor aversion to crossing fast flowing torrents by hopping from rock to rock. She had also been struggling with an upset tummy and it looked like our mission was over when she took ill after just 40 minutes. She had been sick and was now feeling very woozy. Vertigo? This was no place to be feeling below par. I wanted to head back immediately. We decided to take a break, have a good rest and see how she felt. Ten minutes later she was re-hydrated and determined to continue. I did not argue. It was harder than I thought. We struggled upwards, weighed down by excessive clothing and gear and some of the language was colourful. At one point we were overtaken by a gleeful 5 year old who looked at us as if to say "Daddy what is wrong with those people"? This was both demoralising and motivating. If we could up our pace the ankle-biter would fade later and we could pass her with a little wink. My wife reminded me were not racing. Chastised and with the visibility fast fading I decided to pause to grab a few photos looking back down towards Wastwater as we trudged upwards along the route. It wasn't long before the valley below vanished below the cloud. 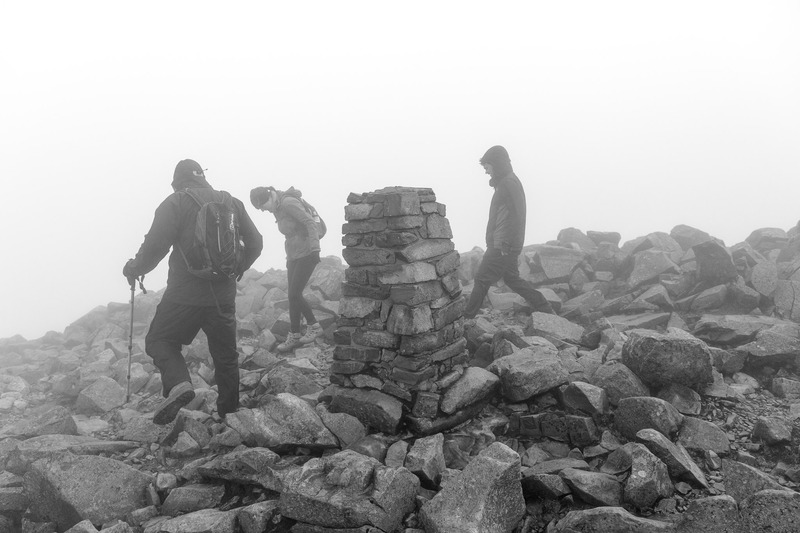 The visibility and temperature were dropping with every cairn. Thankfully a steady stream of people gave us a fair idea we were heading on the right track and we opted for a slightly longer but gentler route. It was at about this point we ran out of water and flapjacks. The flapjacks were less of an issue but I'd seen enough adventure films to know the water was serious(ish). We were unlikely to perish after a good breakfast and we were well hydrated but this was piddle poor planning. We had a bottle though and a mountain stream nearby, so no real danger. 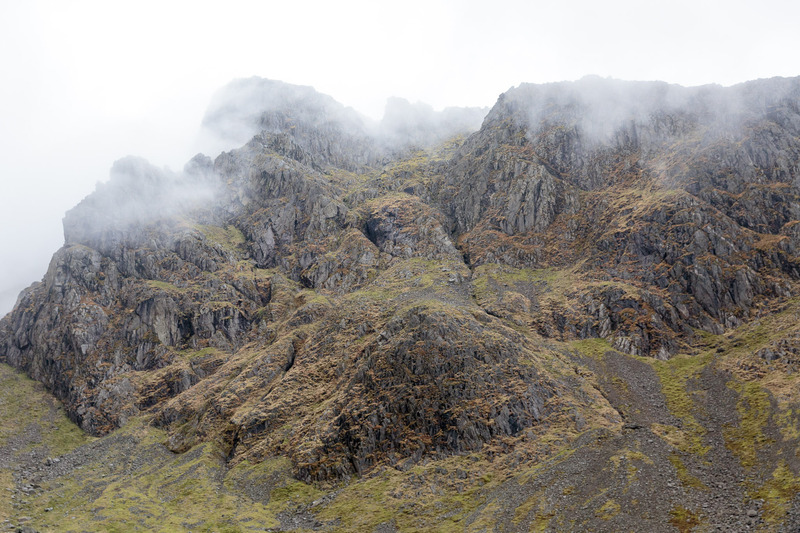 As we climbed on, the temperature started to drop further and we added layers slowly to remain comfortable. I was amazed to see people in shorts, trainers, thin shirts and with no water proofing at all. Knowing how quickly things can change this was a little foolhardy. I was mindful of the effect that the windchill would have at the summit. There is something about the monotony of just placing one foot in front of the other and marching onwards that is very cleansing mentally. Your entire focus is on reaching the end, on looking where you place your feet and little else. It reminded me of how good (not for my knees) my trail running was a few years back. The physical struggle calms the mental struggle. Well except perhaps the mental struggle I was having with my growing thirst. 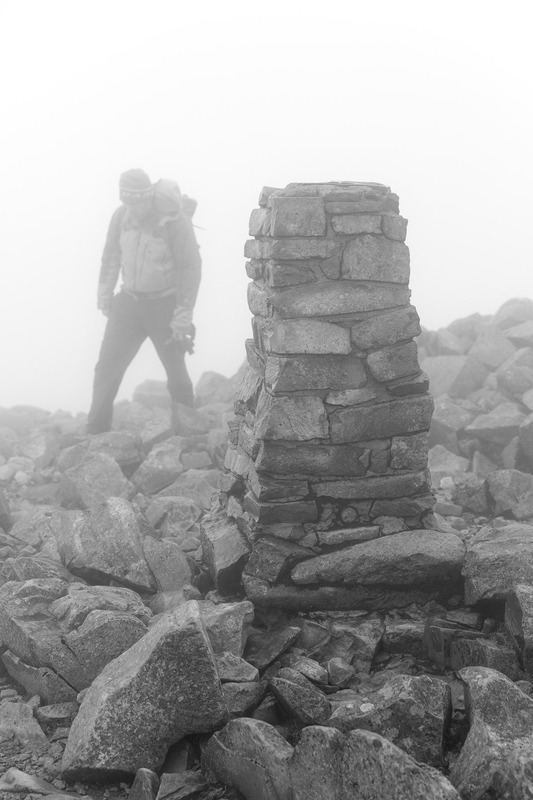 The visibility was now becoming a little tricky as you could not see the next cairn from the last. You had to pause and wait until you caught a glimpse of the next marker. A couple of times we used 'guesswork' and erred very slightly off course. 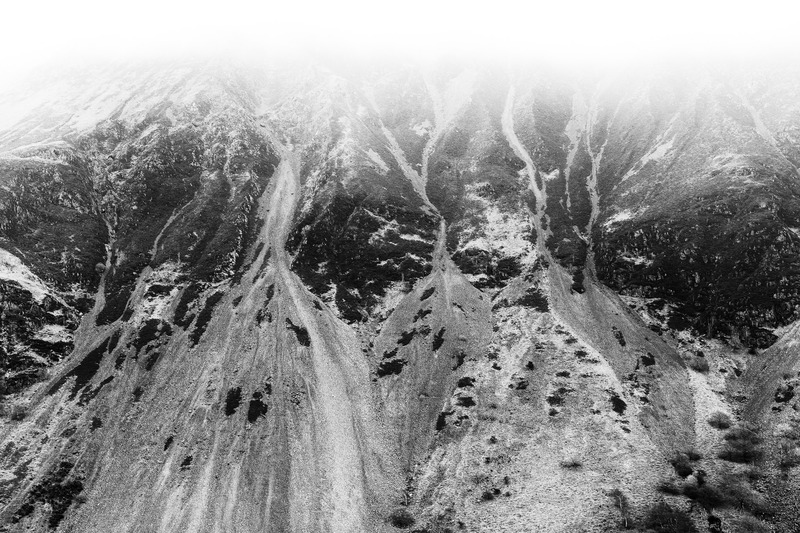 It is hard to fathom what it must be like to climb one of these mountains in a 'white out'. I have heard the stories of those who could not see their hands in front of their faces and I've even seen the scars of some who were less fortunate in similar conditions. I have absolute respect for real climbers, real mountaineers but I'm not sure it is for me. I love to test myself but I think that is something I would be training very long and very hard towards. You could see how easy it would be to lose your bearings. The landscape was a constant, the horizon a blur but thankfully there weren't too many sheer drops. There were times when I wondered if we would make it, where I cursed the fatigue and pain. I thought quickly of others who would face far harder challenges walking up this rock and I cast off any self pity I was feeling. Having watched multi limb amputees literally drag themselves up Kilimanjaro, I was not for a minute going to think of this as hard going. Onwards and forwards. Looking at our watches we were fairly certain we were close to our target. We'd started to ask those descending and a few ummed and aahhed but the feedback was variable. 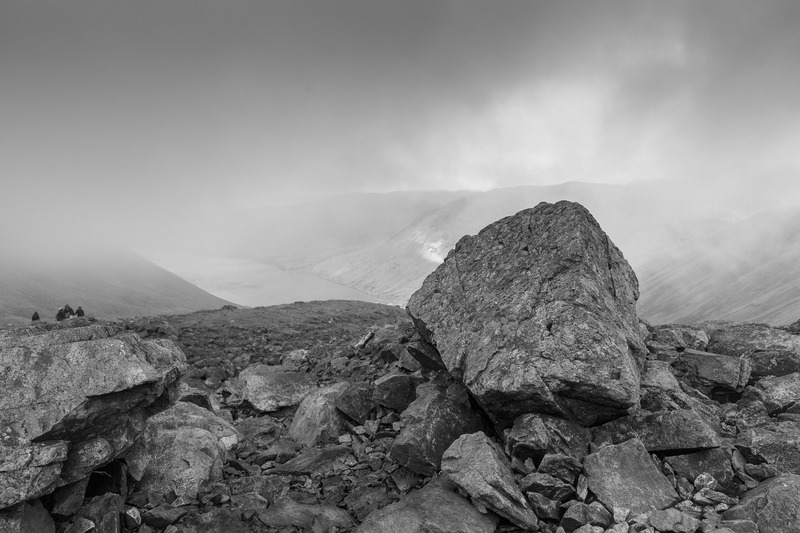 The ground was now looser, the paths well below us and the cairns appeared closer together. The inability to see your destination was perhaps a blessing but it did have a strange affect on the mind as you trudged on into the milky abyss. We headed up over another rise there was a larger cairn where we found a couple sheltering from the growing windchill. They too were wondering where the summit was and whether this was it? Their phones suggested it was further ahead into the gloom. A gentleman trotted past carrying a GPS and we all decided to follow him rather than trust Google Maps. The wind was really jacking up now and the windchill was biting. I was absolutely fine in a base layer, fleece and shirt jacket and thankful for the gloves and liners. 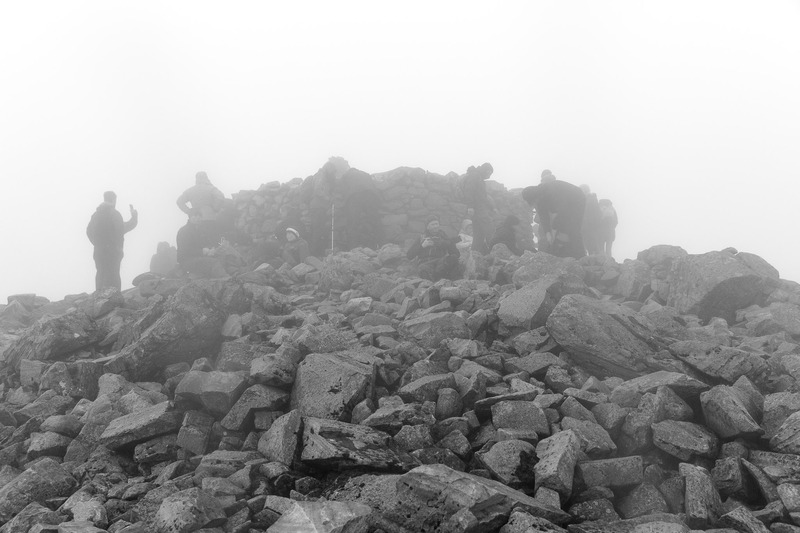 After a few minutes navigating the boulder fields the dark outlines of a few people started to emerge through the cloud and there was a raised structure, the summit. We had made it. Most people were hunkered down sheltering from the windchill behind the summit. It was probably -10c in the wind. The gloves came off for the camera and my trigger hand was useless in just a couple of minutes. 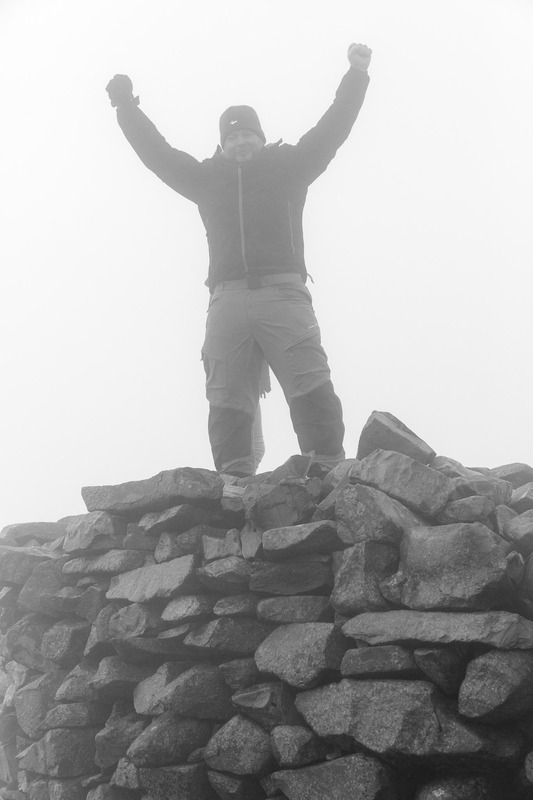 It is a wonderful feeling to reach a summit, to know the hardest part of the climb is over. A great sense of achievement and suddenly there was instant talk of wanting more and different challenges. Visibility was at best 20m so I tended more to the obligatory selfies and some atmospheric shots. There would be no sweeping panoramas today. 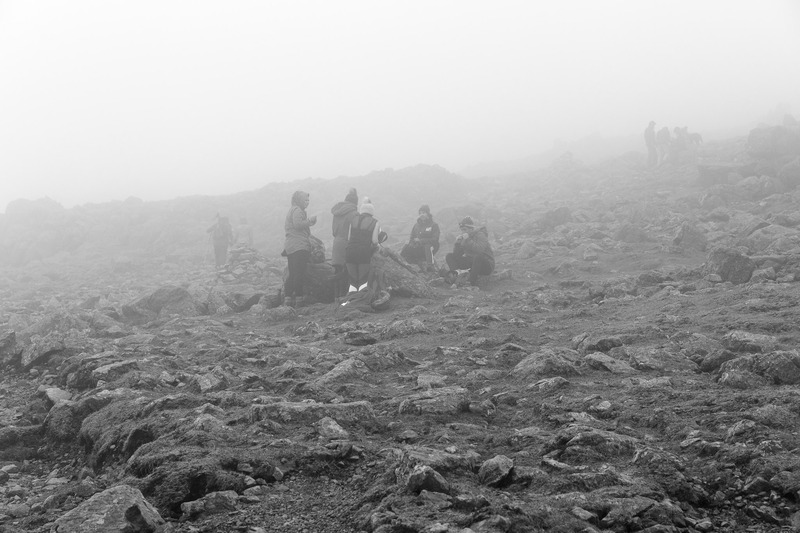 On account of the lack of visibility, the freezing wind, our lack of snacks and water we didn't hang about long. We set our sights on the pub, something we do regularly and something that perhaps had slowed our ascent. A cold pint after a quick descent shone like a beacon. Ironically the ascent had not been the hardest part of the climb for me. 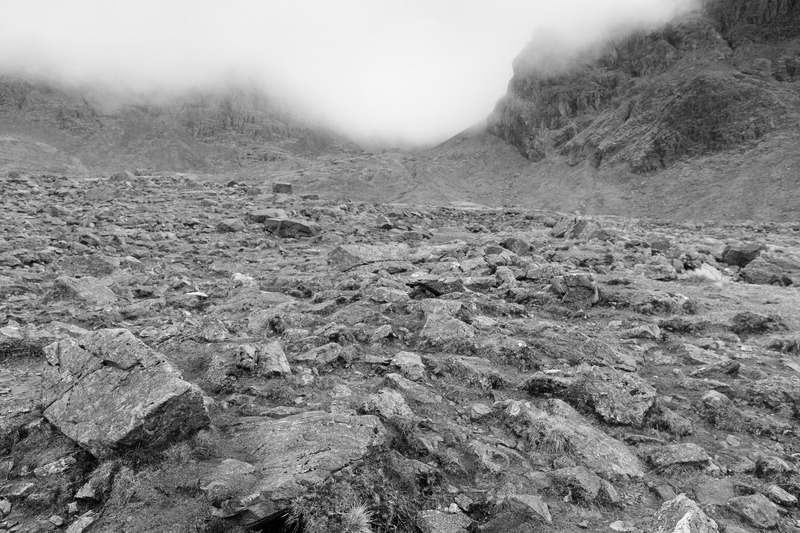 It was going to be every agonising step of the descent on knees that retain very little cartilage. I held out to the halfway point before I had to take a couple of Ibuprofen to try to take the edge of things. Wow. I wasn't expecting that. I was really thankful for my poles, I set them long and was able to take 25% of the weight off my screaming knees. After the ecstacy of reaching the top, I had not contemplated this issue. It was depressing that this could limit me from repeating this kind of adventure. I wasn't the only one and we met others who had allowed far longer for the descent for the very same reasons. One poor woman put on a brave face but I could see that she was in terrible pain. Perhaps new knees one day will allow me to ascend and descend without that nagging feeling that I am wearing myself out one step at a time. I started to dread the following morning. Three quarters of the way down we paused by the Ghyll, in a spot with 4G which meant my wife could get her fill of Tom Hardy, so to speak. I took a rest and decided to get the camera out. It was a stunning spot and I wanted to absorb my surroundings and get away from the negativity that had crept in with the pain of the descent. A babbling brook, waterfalls, the leading lines of fallen trees and wonderful bracket fungi were just the tonic to soothe the soul. I spent perhaps half an hour and knew I would need to come back. As fast as my legs allowed, which alas wasn't very fast at all we made our way back to the tent and then onto a very well earned, memorable pint and dinner at The Strands Inn B&B I can warmly recommend the lamb burger! On the wall was a sign that said 'Beer is proof that God loves us'. Amen. We'll definitely be back. 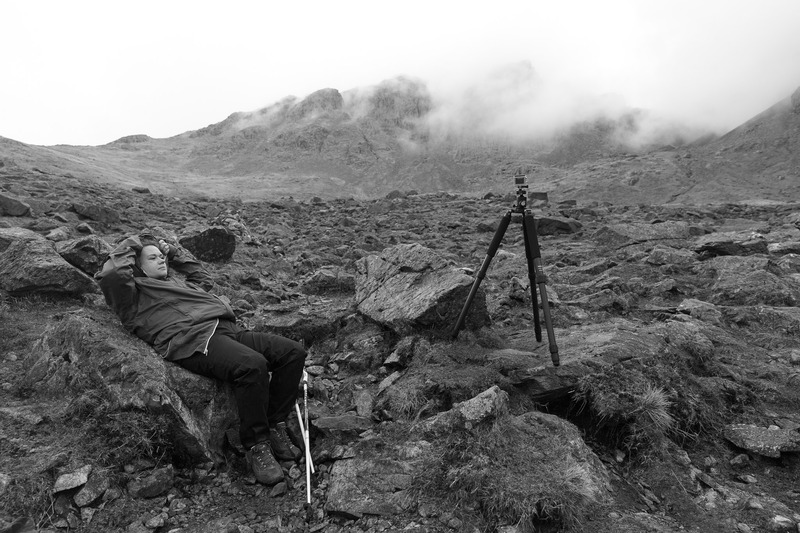 We'll hopefully climb other peaks and perhaps 'over night' higher up to have more time to capture first and last light. It is one of those places that you instantly fall in love with. 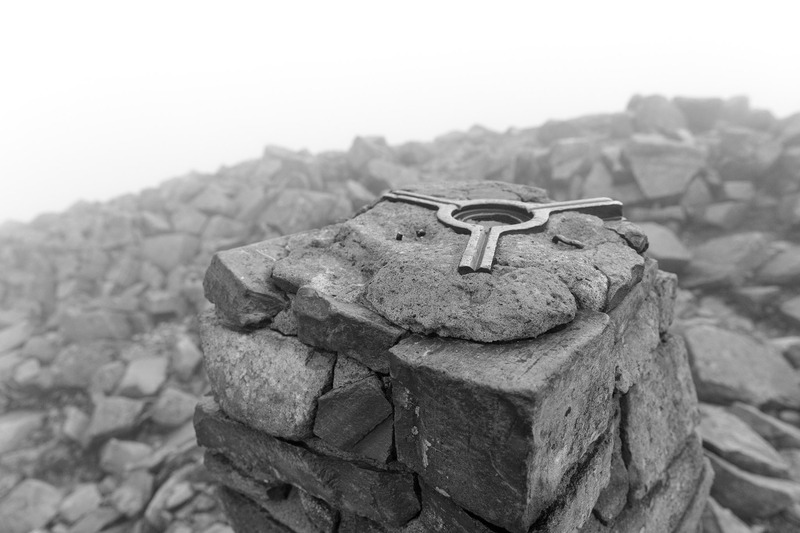 If you get a chance do climb Scafell Pike. Do your own research and make sure you are properly prepared. 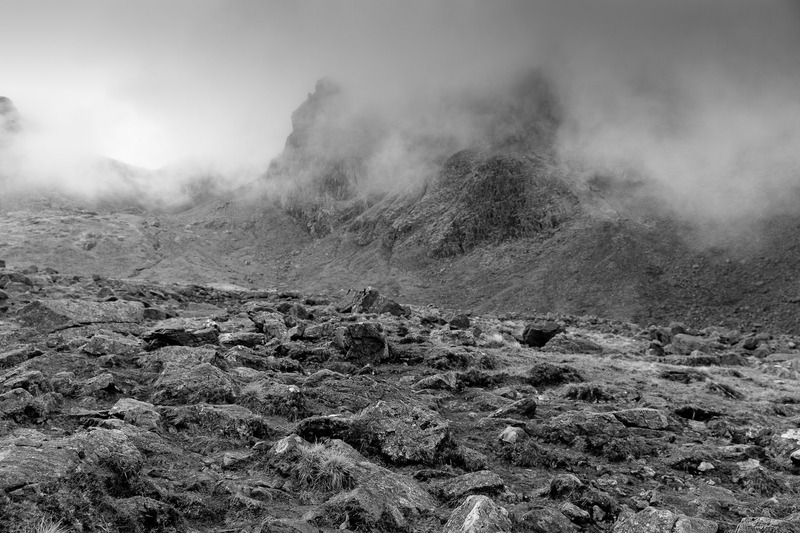 This entry was posted in Musings, Travel and tagged climbing, lake district, landscape photography, national trust, rich clark images, scafell pike, Wasdale.